“Hey! Pretty car!” a random dude shouted to me as he jogged past. 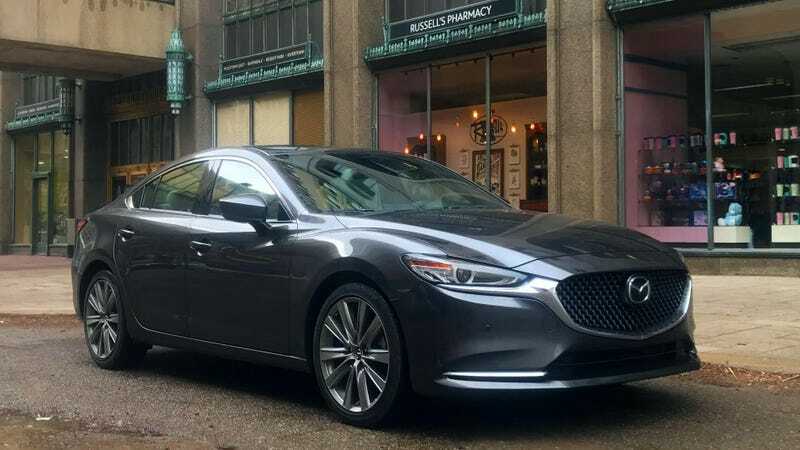 I was taking a dramatic picture of the 2019 Mazda 6 Signature on a rainy afternoon in Detroit and didn’t need his obvious observations. “Very pretty car” he followed up. It’s not just a pretty car, it’s a surprisingly classy one. The new Mazda 6 is certainly eye catching, and the Signature trim makes it the cushiest Mazda sedan ever. While my Mazda 6 loaner had been around the block a few times, it had about 7,000 miles on its odometer, it still had plenty of snap. Now, we’ve reviewed the versions of this car more than once. Heck, I’ve driven the Mazda 6 many times myself. It’s a known quantity. But after almost a year of not driving any sedans, to me, the car felt like a revelation. Maybe not the kind of, fall-to-your-knees driving dynamics that turns casual owners into rabid enthusiasts, but the kind that serves as a reminder as to why sedans deserved their past dominance of the automotive market. I’ll admit upfront: I’ve been avoiding driving press cars for a while now. This may be hard to believe. Getting to drive all of the cars is the best part of the job! However, taking on a press car means storing one of my personal cars or street parking something. And while I love Detroit, it is still, well, Detroit. Street parking, either mine or an automaker’s car, was right out. But I finally caved and I sent my VW wagon named Jolene away to live in the country where some family of mine has an extra space in a very nice, heated garage. Now that my driving schedule was open, it was time to dip a toe back into the water. The Mazda 6 Signature was really a great car to kick off with. A smooth front-wheel-drive, turbocharged sports sedan, that Mazda claims can squeeze out 31 mpg on the highway. The Signature trim is absolutely gorgeous, and almost lets you forget it is a Mazda (until you start hunting for the start button, and remember Mazdas put them waaay up on the dash) I don’t mean that in a bad way, of course. It’s an accessible sort of luxury with plush leather seats and enough legroom to take on hours of road tripping with ease. Getting into that interior is also a breeze, thanks to the copious amounts of headroom. I almost forgot how comfortable it is to simple step into and sit down in a sedan. No hauling yourself up by the interior handle to hop into your SUV, and no crouching down to get into your coupe (or, in the case of my daily driver, a little red wagon). A classy, breezy entrance and exit that won’t knock off your hat or muss your hair, like the good old days. And the ergonomic flow of the interior just works. The way the heat vents and the door fit neatly into each other is lovely. The easy-to-read instrument cluster and fantastic heads-up display projected on the windshield in front of the driver is a huge improvement over the X-Wing-style flip up display in older Mazdas. The spacious and comfortable seats all feel like this is a car built around moving people in the most comfortable way possible—a mission that sometimes feels sacrificed by automakers trying to make cars that are too versatile to be excellent at anything. And by all means, if you go on adventures deep in the forest every weekend, get something rugged. The Mazda 6 may not be the perfect vehicle for you if you need to, say, haul a ton of stuff for your small business making glittery shrinky dinks of U.S. presidents to craft fairs every weekend. But for most of us, especially city rats like me, the Mazda 6 is a sedan that will get you where we need to go in a pleasantly posh manner. And just look how good this car looks rolling around a city. It’s not only the interior that wraps you in luxury. The sharper, sleeker styling notes over the previous design are just enough to knock this car into aspirational luxury territory. One thing that made me very aware I was in a Mazda and not a Mercedes was the road noise. Mazdas have always seemed to let in a little too much ringing from the pavement into the passenger compartment. In a Miata, it’s cute—heck, it’s part of the car’s charm. If you’re worried about the road noise in the MX-5 then you are already well on your way to worrying about exactly the wrong things. But the Mazda 6 is a car reaching for that luxurious label. While the looks are definitely there, and the actual ride of the car is smooth, you’d expect a quieter cruising experience. Part of the reason the noise is so high might be that the doors, while designed to allow the heating vents to perfectly nestle into the door, still feel pretty cheap. There’s not a lot of heft to them. And while the ride is smooth and pliant, I wouldn’t say this is an engaging car to drive. The turbocharged engine has enough motivation to pass slowpokes easily enough during freeway driving, it isn’t something that you’re going to throw into the curves and send chills up your spine. Also, this particular Mazda 6 rings up at about $35,000. That’s the same price as a Mercedes-Benz CLA or an A3—both entry cars into long-recognized luxury brands while Mazda doesn’t really have anywhere else to go from here in terms of luxury sedans. And even though I do love the interior, Mazda has yet to really integrate its digital screens into its center stacks. It still looks like someone is balancing a Kindle on the dash. Not quite what you’re going for in an age where fancy screens cover the interiors of higher end cars. This is a car for the city slicker who wants a luxury ride that is also accessible and easy to use, and doesn’t care about showing off a luxury brand name at the same time. Most of all, it’s a sedan, and a damn fine one for the shrinking number of buyers looking for four wheels, four doors, a trunk, and an engine. It’s gorgeous enough to be noticeable, fun enough to be drivable, and low-key enough for the average driver to feel like they’re getting away with a great car at a great price. It might not drive you to the extreme edge of car enthusiasm, but it’s definitely an enjoyable car to ride in.